A couple months ago Beading Daily’s Michelle Mach sent me a book she wanted me to check out—she was very excited about it. But it never arrived–I think my crafty neighbor must have swiped it (Eileeeen!!). I’ll have to admit, I was secretly relieved because Michelle told me the book was about polymer clay. Now listen, I’m not down on polymer clay—it’s a beautiful medium that can be made into sensational-looking beads. It’s just that I can’t seem to turn it into anything sensational whatsoever. I feel like I’m all thumbs when I work with it, which is just ridiculous since I work with metal clay quite a bit. Maybe it’s the daunting color blending? Yeah, that’s part of it. I’m also not a very clean worker, what with the ever-present cat hair and dust in my home. 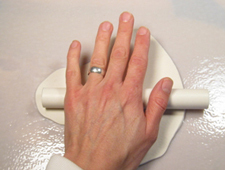 With metal clay the kiln magically whisks that stuff away; not so with polymer clay. Michelle was determined that I see this book, though, so sent me another copy and it arrived. I figured if she was that determined for me to see it, I needed to be determined, too. 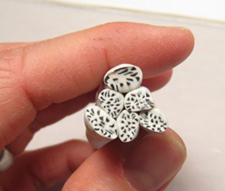 I breathed deep and opened Making Polymer Clay Beads by Carol Blackburn. And . . . um . . . went right out to the store and bought a bunch of polymer clay. Wow. This book is so inspirational, with easy-to-follow step-by-step photos, it feels like even a 10-thumbed-bandit like me could make something nice. Plus, there are tips jammed in every corner of every page and there are so many samples of work, you can’t help but be impressed. 1. 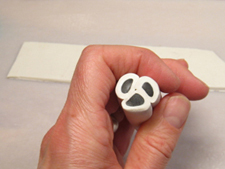 Working on a smooth, flat surface, roll out a sheet of soft white polymer clay. 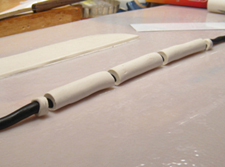 (I used a piece of PVC pipe to roll the clay flat). 2. 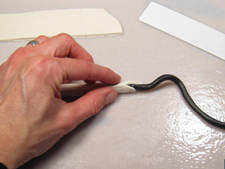 Use your palm to roll soft black polymer clay into a skinny snake. 3. 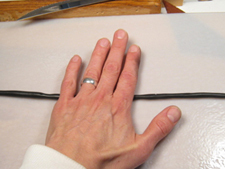 Cut the white sheet into a rectangle and lay the black snake inside it. Pinch the sheet around the snake completely cover it. 4. Slice the cane into even pieces. 5. Gather the pieces together and lightly squish them together. 6. Roll this new bunch into a snake, cut it into even pieces, and lightly squish it together. 7. Repeat the previous step. 8. 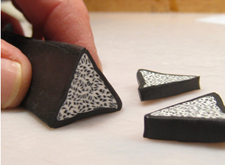 I pressed my cane into a triangle shape and covered it with a sheet of black polymer clay, then sliced it into triangles. I’ll drill holes in the clay after it’s baked so I can string them. Not too shabby for my first “real” try, eh? I can tell this could be addicting. I can also tell I’m going to need a couple of classes and lots of practice to get cleaner results, but I’m definitely encouraged. 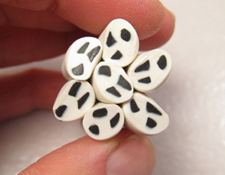 Are you a polymer clay bead maker? What tips do you have for me as I engage in building up yet another arm of my stash? Please share them on the website!